Do you work for Upwork? Upwork (formerly Elance-oDesk) is a freelance services platform for top companies to hire and work with talented independent professionals. Learning about Upwork? We can help. "It is the best platform for freelance jobs in the world"
"Upwork is best for hire talented freelancer"
Upwork is best platform for hire talented freelancer for complete project.Upwork authentic every registered freelancer upwork also take video interview for authenticate freelancer so no any fraud freelancer on upwork.We can easily post job project and get many numbers of freelancers bid on our job within few minutes and we can send interview invitation to selected freelancer and after interview we can hire freelancer.We can hire freelancer for hourly or fixed price base project.Upwork provide good chat interface for communicate with freelancer. Upwork take atleast 2 weeks for send hourly payments to freelancer account.Upwork not provide any way to send payments to freelancer instantly.Upwork smartphone app have not all feature same feature available in web version.So we cant use complete upwork on our smartphone.This is not good. Upwork is best platform for find perfect freelancer for complete our project. Upwork is very helpful for us to find talented professional freelancer to complete our project task in our timeframe.Upwork very well managed payment system so we can easily send payment to freelancer after complete our job.Upwork is help to grow our business. "A simple, fast and efficient way to connect with job opportunities around the world." As a Freelancer, been updated in the work platforms is essential, and with UpWork I found a fast, simple and efficient option to access a thousands of proposals from around the world through the same application thus having the opportunity to get in touch with entrepreneurs and companies around the world for free in a completely secure website. They offer a very good service. Setting up the profile is easy and the guides make the procedure even easier so having a professional profile is something everyone can do. On the other hand, the work options and the organization of the page are usually very good and through it. I have been able to contact companies from all over the world that has opened me the doors to infinite opportunities. It is really a tool to find a job very simple to use. A simple, fast and efficient way to connect with job opportunities around the world. In general I have no complaints about the service of Upwork but perhaps my biggest misadventure with them has been the fact that they usually place the profiles in private when you have been some time without entering money to the page, so that it becomes a bit more cumbersome to get customers or being contacted by companies, since they cannot access to all of your information, and I think, it is not a productive decision because they make difficult instead of facilitating the option of getting clients or job offers. UpWork is really a very efficient platform when you are looking for job offers and as FreeLancer offers you a very wide and varied market of secure options to which you can opt without complications. Personally, I recommend it for all those who are looking to expand their options in the market as it is the preferred option of many companies internationally looking for qualified professionals for different jobs. My experience with UpWork has been very pleasant and I think they are a very efficient page when it comes to providing support for companies that are looking to hire, as well as for freelancers who are in search of job opportunities. For the same and personally, I have not major conflicts with the platform. At first the acceptance of the work profile may be a bit complicated, since they are saturated very quickly with people who work in the same field, and therefore later applications of people seeking to fill the same lines of work are denied, but in general the profile can be edited once it is accepted and getting offers related to each field is very simple although most companies are slow to respond to offers. "One of the best freelancing site Upwork"
Easy to manage your freelancer's performance: once you have found the right freelancer, you would need to direct them to finish your project as you require. Using Upwork, you will be able to monitor your freelancer's work online. Working hours are recorded and screenshots can be requested through Upwork's software (need to install Upwork on your computer). Job Success score has nothing to do with "job success." It is a arbitrary number that punishes freelancers like me that aren't doing services where a company would use me again and again. Also, they punish you for leaving jobs open even though most clients want to leave the job open in case they have followup questions. I honestly recommend you guys to check out this site! Upwork is great if you want to work from home. It is more organized than any online platform. It give opportunity to interact with different people of different regions and gives a vast work experience. Hi I have used upwork and it is realy giving me real money. Firstly I thought it will be like other websites which promises that you will get a freelance job and you will earn but after registration you dont get job. After registration on Upwork.com just within 2 days I got a work of PDF editor. As I had registered then I did communicated with client through message to understand to what exactly they want in their PDF and then I had accepted. Hardly 20 minute it took and I got 7$. I loved it. As you get more work client gives their feed backs. And these sets your stars and again upcoming client can see your work and decide by your star how work you do for them. I got money from it. I am sure you will get also. If you are looking for job but if you don't want office, boss, target, limited salary, boring faces. Then this place is better, be financial free. "A very good way of find a freelancer for a project"
Upwork has definetely helped us find several freelancers that are responsible for the success of a lot of our developments. I like everything about this website. I love this. It has helped me earn a lot of money by designing a lot of websites and graphic designs. It is one of the best freelancing websites of all time. Pays great . I have earned 1000 dollars. This site keeps its promises. I love this. There is nothing to dislike about this site. Nothing to dislike at all. I dont know what i would do without this website. One of the best freelancing sites in the world. Great clients to work with. Excellent platform. I would recommend everyone to work in upwork. One of the best freelancing sites to earn extra cash. Work from anywhere and everywhere. One of the best in the business. It helps me earn money. A great platform for freelancers. I really love how seamless it is to communicate with clients and keep track of my customer base. Also, I really like the newest feature that allows the freelancer to propose a new project to a client. I wish contracts offered a per word price option. Most writers base their bid off of per word. Also, I have a client that I used to write several blogs for and would submit a word count to him. It would be nice to not have to figure up the dollar amount, but just to submit a word count. Additionally, I would like to be able to submit a milestone proposal to a project. You are currently able to submit a project proposal, but sometimes I would like to be able to propose a milestone to remind a client to set it up and pay. Make your profile the best it can be. This is the equivalent of your resume and the better it is, the more likely you are to gain some traction. Also, the small projects might not seem worth it at first, but go ahead and do a few just to bump up your Upward hours and experience. I have been able to connect with clients I would have otherwise never known of or met. I have been able to provide them with business solutions - developing content - and made money. "FREELANCER WHO IS MAKING IT OFF UPWORK"
Upwork puts hundreds of clients who are ready to hire at your fingertips. They organize your tasks in the My Jobs section, offer payment protection, and seamlessly integrate communication with clients with messages. Although I currently possess a 99 percent job success score, the system calculates this based on reviews. Reviews can be biased and lack integrity. Also, Upwork seems to have a lot of maintenance going on lately which disallows users to check messages during those times. I also wish that clients were required to communicate on Upwork only. Completely fill out your profile. Take tests. Respond to all messages and invites ASAP. The majority of my clients are on Upwork. I don't have to worry about being paid, and I have most of my projects in one space. The community is good: many active forum posters and quick response times from team members. Upwork is awesome platform for freelancers. So you do n't have to. And then upwork changed their structure so that the percentage of the fee varies, depending on how many hours the contractor has worked for the concern. Variety is not available and chat option should also have option for video call which will design it much good in this segment. Biggest problem of upwork is that good client is coming to platform, chooses someone who offer low price and get's low eminence service. Although some clients request experts, few of them are willing to pay an masterful's rate, so you may need to look elsewhere depending on your level of expertise. One can search the job which he is comfortable with and in which one is ultimate at. It would be amazing if you could place no “ downwards ” limit on the hourly working price or on fixed contracts, as this might benefit many user clients and freelancers. It give a good platform. It is by far the optimum freelancing website i've used in terms of stability and community. It also helps you find and connect with off-centre clients. Upwork is a great platform for freelancing if you want to stay at home and do what you love remotely. User-friendly interface, great structure, you're free to apply for whatever job that you wish. There is a great job search tool so you can definitely find the job that fits you. There is a good rating system so you can always check whether the client has good reviews or not. -The Upwork fee is a little bit too high, but it's actually worth it. -For Top freelancers there was a Chat option with the Upwork Support but it disappeared, so the best option for now is opening a request and waiting for a response. -If the client is not responsive, then if you end the contract on your own then you will not receive a feedback and it will negatively influence your JJS. On the other hand, open contracts may negatively influence your JSS too. Would be great if some actions would have been taken to give this a solution. -When you apply for a job, and the person hires another freelancer, the connects(points) which you used for applying for the job are not being given back to you. "Great freelance resource in a pinch"
I like the ease of everything. From creating a job description to hiring, Upwork made it a very simple process. So far, I haven't been super impressed with the talent we're finding (highly-rated, too). I am unaware of what a freelancer has to do in order to sign up for Upwork, but some kind of test or evaluation might be helpful. In terms of the actual site, the load time is slow and their messaging tool feels clunky. I also don't like how some of my requirements don't actually prevent freelancers from applying if they don't meet that criteria. Sure, I can filter them out but when I have a list of 60+ candidates for a job and 95% of them don't meet my preferences, that becomes overwhelming. It's good to fill needs every now and then, but you need to go into it with realistic expectations. That is, you're hiring strangers based on what they say they can do. It's an easy way to find freelancers for any number of functions -- graphic design, web development, SEO. It is a freelancing platform where freelancers can get work and employers can employee freelancers.Using upwork is very much easy and great.Using upwork you can easily get any project done because it has vast number of developers from various fields around the globe.They deliver your work and you can pay them if you are satisfied by work.Upwork is the mediator that makes sure that no fraud happens and everyone gets what they want. Upwork should add an option for hiring more than one developer for a single project which will help us get our work done at much pace and with great perfection. It is the best place to get your work done easily and at a comparatively lower cost.The concept of freelancing is really great and helped both the employer and the developer.One to get work and another to get the work done under requirement so easily.Upwork is recommended for both hiring as well as working. I have used upwork at my work whenever during our project we feel that a certain module of the project requires additional skills that we don't have than we give that module to the freelancer to develop.The non disclosure agreement is also there which makes sure that the developer cannot give that developed module to anyone else which is great. "Good site but highly competitive "
With Upwork I like that you can find projects similar to your niche of work. My dislikes with Upwork is it is a highly competive site with people seeking to low ball projects. Plus if you are new to Upwork be mindful of your tokkens. I was using all in hopes of some hope in response but you come out better doing actual research and being mindful of the clients actual niche of work and if you have prime examples of the particular project. Finding clients, once again it’s a competitive site and some jobs maybe lower than others but the more low ball projects you do the more clientele it helps you build for better clients. Vast array of talented international labour at your finger tips. Transparent fees, communication and tender process. Talent has access to skills test and there is an ability to see reviews of work that developers/users have done in the past. For those paid hourly, the time card app allows you to monitor your international team easily. Automatic payments. The fees are a considerably percentage on a first time project with a new user, the clip of their fees to Upwork is fairly sizable (it's a big of a regressive tax). It's difficult to find old messages or to download messages locally from their messaging system. Everything has to be done in USD. You are forced to convert using their payment system (2.5% fee) from your local currency to USD. Development of a website and promotional material relating to that website. With Upwork I have been able to manage and hire an internationally distributed team that can provide 24/7 support. I like how upwork works.Using upwork you get your desired job and you can almost always work on your own time.You can also choose the delivery date by mutual communication between employee and employer.So much flexibility helps you to work freely and independently.And you can search for the projects according to your skills.This is a smart way of doing work. It is very helpful for freelancers but it is also extremely competitive. It is tough to find clients at first but the more quality work you complete the better business gets. Recommended freelancing platform for working flexibly and indpendently at your own time and on your skills based project.Upwork is a best platform that gives you advanced features to eazily work according to your requirement. We use upwork for finding projects according to our skills and each team can take projects which they like so that they can work freely and comfortably.We also deliver our projects on time and get our payout easily from the employer.This is the best way and almost the smart way of working in this competitive era. "Great Place To Get Appropriate projects"
Upwork is best in every feature that it provides.Using upwork any employer can post a project according to their project definition and their budget,Developers like us go to upwork find the project according to their field and bid on that project if the employer agrees with our knowledge and budget they award us the project and than we do the project.This whole system is best. The main thing is patience because when you are a beginner you do not get work that easily.so they should setup some things so that it becomes easy for a beginner to begin freelancing. Upwork is recommended to find the work that is appropriate for you and you can easily do it with your expertise and get paid for that so upwork is seiously a smart platform to work with. We at our company are using upwork since many time and using upwork we have done many projects and delivered them on time.The money is credited to our upwork account and then to us.So upwork is great for us for doing job which we do better. "Great for getting new clients"
I like the job feed and the way they let you save searches and organize your past job hunts. The UI is pretty good, it's easy to tell what's what, and to get the info you need to decide if you want to apply. I think the fees are outrageous for the level of support that is provided. I'm not sure why it's so dang expensive to use their platform, when there's not any real value other than the connections. Be sure to factor their hefty fees into your cost when pricing out jobs, or you will quickly regret it. Just something to be extra aware of during the estimating phase! I'm finding leads, tracking time, invoicing, and accepting payments with this platform. I like their mobile app and the smooth notification system. I like that I can find side work and earn extra money using Upwork. Upwork allows freelancers to search for jobs and submit proposals. When accepted, it is easy to contact the client in Messages and work out the details of the job. I do not like the hefty fee. In the work that I do (data entry, virtual assistance, transcription), the jobs are typically small and pay small. The 20% fee really bites off a chunk of what I am earning, and makes it difficult to want to apply for smaller jobs. For example, I may transcribe a 30-minute audio file, for which I would charge around $40. Upwork takes $8 from my earnings, and that is before I owe taxes at the end of the year. So I am earning below $30 though I am charging a fair rate. Upwork is also difficult to navigate. The whole process of job listing > proposal > hire > communication > submit work > payment should be led by Upwork to make the process easily navigable. However, unless you have used it before, you must dig through the nav menu to find where you are in the process. This is not user-friendly. If you do not mind the fee, or are in a line of work with large scale projects (such as web development), this would be a great tool for freelancing! Upwork allows me to gain experience in my field while working from home. I am able to complete projects on my own time and discuss details directly with the client. I also am able to view a client's profile and reviews before applying for a job, which makes it easy to avoid work that is too cheap or a scam. 2. )Also the payment option is great,you can get your payment in any currency that you want without any extra fee cut. 3. )Also despite of working sometimes you need to hire also because of certain work that you can't do and leave it to experts which you can find on upwork. The thing that I dislike about upwork is that they don't provide option to give our project to collagrated developers i.e. giving your single work/project to more than one developers for them to develop collaboratively. I would recommend upwork for getting work of your choice and work at your time and deliver at your own time also you get your work done by such professionalists who also work like same and their timely payments are also good so that you can be sure that your payment will be easily done without any hassle in any currency you want. We use upwork to get work for our part time and use upwork to hire people from various experts.We use upwork regularly and because their ontime payments which you can withdraw every month it is just great in case of money.Actually our company is supported by platforms like upwork. 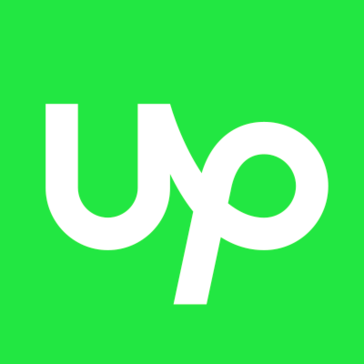 I like almost everything about upwork.The way of uploading your portfolio,Bidding for the project and getting awarded,Non biased payment methods so that you feel secure that you will be paid for the work done,Also the contest option is also great.And around all this you can create your account and start bidding on the go also the dashboard is attractive and easy to use UI. The commision taken by them on both sides is more so it is not really fair. I recommend upwork for freelancing and also hiring other developers because it is a great B2B transperent buisness platform so it is easy and great to work on upwork so you would surely want to try it. We use upwork to find work and develop products as the clients on upwork ask us to do and earn money through upwork.We get various projects from upwork as well as other freelancing websites so help us to earn some money so upwork is like heart to our company. "Easily Work And Hire Using Upwork"
I like many things about upwork like it is very easy to use upwork both for employees and employers.The dashboard is also user friendly.Payment options are transparent enough for both the sides.You can hire developers from a variety of IT fields and also you can choose which one to hire by looking at their portfolios and reviews based on previous works. The commission taken by upwork is high but i thing all the similar platform take higher commission so I think they should reduce it. We would recommend using upwork for hiring people from the variety of field and get your work done and delivered on time and with the proper payment given and also the work delivered is of high quality so upwork is greatly recommended. We use upwork to higher developers for developing different project modules from the project for which we don't have expertise and after the product is delivered we pay them so you get best quality of work done for proper payment so upwork is working good for that. Upwork is a great platform to hire freelancers,it has freelancers from all the fields also the process of hiring freelancer that is giving the particular project to the freelancer who we like according to their portfolio is a great way.Your money is also secured by upwork,that is even developers feel secure that they will get the approproate money for their work so overall from my point of view upwork is best. There should be an option to award a single project to more than 1 freelancer than it will just be amazing. I would recommend freelancer for any project for which you don't have professionals with you also if you need advice for certain module than also you can go for a developer on upwork because as i mentioned upwork has developers from almost all fields. We use upwork to hire freelancers according to the project requirement,for suppose we don't have a unity3d developer for a certain project and we don't have many projects of unity3d than we don't hire a developer instead we give that project to freelancer through upwork. "Upwork helped me start freelancer career"
I love Upwork because it's really easy to find new clients. Freelancers create a profile and post samples of work and can bid on projects or clients invite them by themselves. I've been really busy and I don't even have to look for projects. I get invited to projects almost daily and I have to turn many of them down. I don't like the fees. I don't think it's fair I have to pay every time I work. It gets quite expensive. There are spam posts sometimes, but once you learn to recognize those, you'll be ok. There are some jobs that pay very little, but I don't even apply to those. Upwork has a bad reputation for those kind of jobs, but it's all about the freelancer and what they decide to work on. There are great clients that pay above average rates and there are many of them. So don't get discouraged by people that did not have success on Upwork. If you put enough work into making your profile stand out, you can make a lot of money. Go for it. You don't have anything to lose. It's a great website for anyone who wants to hustle on the side or start freelancing full time. There are many large companies even hiring full-time employees, so it's a great way to market yourself. Upwork provides an easy way to find clints to freelancers. "Upwork is a great place to find quality contractors"
Upwork (formerly Odesk) is a really cool service that easily connects you to quality contractors from around the world. Are you looking for affordable labor to complete data entry or other black and white tasks? Then you can easily find contractors in China, India or other cost-advantageous countries for your jobs. Looking for super premium high-quality contractors in your native tongue? Upwork is great for that too. They used to charge a flat 10% rate to the contractor (but made that very apparent to the employer so you knew exactly how much the contractor was making, which is good) but now the pricing structure is different and more confusing. Conduct a video call (if possible) with each one of the contractors who applied for your job. I also recommend asking a question in your job posting that requires a decent bit of thought such as "based on the initial requirements I've provided in the job description, do you have any ideas for how we can improve X process?" This will really help you vet out the bad from the potentially really good. Finding really affordable contractors to complete anything from high-level business coaching/consulting to talented graphic designers to data entry specialists. Upwork handles it all for me. "Worst platform ever. I got scammed and Upwork sided with the scammer"
Someone I hired from the Philippines scammed me out of the project. I paid him every week, and he continuously made delays. After 6 months, he showed no results so I filed a dispute with Upwork. Upwork said there was nothing I could do since I waited in hope that the freelancer would fix the situation, but instead they sided with the freelancer and I'm out of 10,000 dollars with no program that I paid for. Worst platform ever, I wouldn't recommend it for any business. It's a perfect platform if you live internationally and scam someone out of money so they can't take legal action against you. Don't use Upwork. Everything. This company is a scam facilitating Platform that lies to the public. Do not trust them to help you even if they take a huge commission from payments. Don't touch this platform unless you are trying to get scammed! Disputes take over 30 days and don't work like a bank or paypal or any other platform. The only benefits are to scammers. "UPWORK WILL SAVE YOU A LOT OF MONEY AND TIME FOR PERSONAL AND BUSINESS PROJECTS"
I´ve been using Upwork for a while, and I have to say that, among its competitors, it’s the best hiring platform (even better than Freelancer, which a reviewed previously). There are many things I like about Upwork: it´s really easy to post a job on Upwork, and it´s free (you only pay a 2% fee if you hire someone, which is superb); this way, I can easily hire freelancers to outsource some of the tasks I have to do, and for the best price. Also, I love the feature that Upwork offers, which matches the best candidates to my job, with a blue legend (Best-Match). Moreover, I really enjoy its videochat, which allows me to hold my meetings with freelancers directly on Upwork´s site or app. Most of the time, you´ll love using Upwork. Something unpleasant happened to me a few months ago: I paid a client and she he didn´t perform the job correctly, so I asked for a refund. Upwork supposedly refunded the amount but it was never reflected on my bank account. This really disappointed me, as I was a complete Upwork fan, and now I hate that there´s something I dislike about this service. I have to say that this has happened to me only once (because I had to ask for a refund only one time) so I think it might be a mistake that can happen to anyone. Upwork people, please, you have a great platform out there. It would be great if you could place no “downwards” limit on the hourly working price or on fixed contracts, as this might benefit many user clients and freelancers. The answer to this is simple: outsourcing. As I study and work from home, I don´t have a lot of time available, and that´s why I always need someone to help me develop and finish my projects. Here´s where Upwork comes to the the rescue, because it helps me find the most qualified people, at the best prices (and even at the price I can pay). I think that using Upwork is one of the best things that has happened to me, and I´m not exaggerating. "Cool application but needs improvement"
The application has features that enable businesses and individual employers to discover the best talent. Plus, employers can further screen candidates by setting up interviews with them. This allows them to verify whether the freelancer indeed has the right set of skills and qualities they are looking for.With Upwork, employers can pay their hired freelancers as soon as the job has been reviewed. They have the ability to pre-fund their accounts to be able to automatically pay for services rendered. But if they prefer to pay through other means, the platform also supports credit cards payments and electronic payment gateway transactions. These options allow them to choose which is more convenient for them for greater financial protection. The pay at Upwork is very poor and often times competition for a project can be cut-throat. I don't recommend it unless you are a large firm and have the capacity to work on many projects at once as its difficult to earn a fair amount of pay otherwise. Reduce the fees, more involvement of the consultants, filter the fake accounts. "Great place to get clients that keep coming back"
I like how it shows immediately your "grade" to potential clients and gives the opportunity for your past clients to leave a review. That definitely helps you get more projects and work opportunities for the future. Also, as you move up the ladder within the site, Upwork works as sort of a "third party", sending out your profile to potential clients (especially new ones), who then send you invites. After only two years working on the site, I now hardly ever send out "Connects" for proposals, and apply only for those who invited me to interview for them. I dislike how the pay is usually pretty low in the beginning, despite your credentials. Especially with the cut that Upwork takes, this can be pretty discouraging. But once you have experience on the site, the salary changes, possibly skyrockets depending on your business skills, and the percentage that Upwork takes decreases as you earn. Definitely sign up on Upwork for any type of freelancing that you want or that you can give. It is a great resource for your work to get your feet off the ground and to make all kinds of profit. The sky is the limit! I work on Upwork as a freelance writer. Upwork gives me the opportunity to be able to apply for jobs and projects that I wouldn‘t otherwise have the opportunity to be in touch with. I have gotten many clients for my business and have gained a lot of profit from it. As long as you are diligent in your search for projects, ask for client feedback along the way and keep raising your price as you go on, your work can be extremely profitable!
. Best possible maintenance and customer support.
. Payment protect gives you an extra push to choose upwork to work as a freelancer.
. User interface is very good.
. The feedback system is good.
. One can work from anywhere and any time.
. You can work for anyone in the world.
. The job pricing is very much reduced. Though it was mentioned a couple of times to upwork through feedback and suggestions, there are still lots of jobs that are being under paid. Few freelancers work for much lower prices which is reducing the market value.
. The payment from upwork takes around two weeks from the review time which is too much. These two are my only concerns. I highly recommend every one to use upwork. It is the best platform I have come across in my career for home based employment. One can search the job which he is comfortable with and in which one is best at. This is a great opportunity for all the people who are looking to work from home at their preferred timings. I do all my projects through upwork.
. I can work in my comfortable timings.
. I can work on projects which best suites me.
. I need not worry about the payment because upwork will be taking care of it, i just need to track the time. "Useful but tough to get going"
I like how easy it is to setup a profile. I like that they gave me extra credits for having a complete profile. This gave me the ability to submit for more jobs. The whole user experience is very easy and applying for jobs is simple as well. It’s difficult to get a first job. I’ve used up all my credits and I haven’t gotten anything yet. This is even with ‘rising star’ a boost for newbies activated. Its difficult to break through and get your first job. Unless you’ve had a good ‘job score’ most jobs won’t accept you. However, to get a good job score you need to be hired. It’s a catch 22. I wish it was easier for new people to be validated and to get their first job. Build your portfolio and upload your BEST work. It can help I hear. Finding new clients for freelance work. There is a large network of people posting jobs that I apply for. Makes it quick and easy to apply for jobs. .The first one would obviously be that you can earn work through upwork. .They provided a startup job if you could not earn a job for a particular period of time. .Payment protection is another great feature in upwork. .The interview before hiring helps both the clients and freelancers. .The time tracking software and the work dairy are great and a best way for a honest contract. .It provides both fixed price jobs and hourly contracts. .The pricing standards and the expert level calculations are just wonderful. .The upwork support is the best i have come across. .Job search criteria is also good. .The features like, save the job, save the search are also good and flexible. .The refund option, withdraw facilities are just amazing. I could not say that i dislike this, but this is the only feature that keeps bugging me. Once the work or the contract is ended, and the payment is made, the payment is kept under upwork escrow for a week after the payment is made by the client. And then, from there, to get the money credited into the bank account, it takes another week. So on a whole, I cannot use the money for two weeks which is too much for me. I highly recommend Upwork for all the freelancers. This is the best online site with the least possible fraudsters. The rest of the sites have lots of frauds and less number of real clients. So i strongly recommend freelancers to try upwork. .The major problem of earning money is solved. .I need not work under someone for earning money. .I can work from anywhere in the world. .I can work on the projects which I choose to work. .I can work at any comfortable hours for me. .I can work for the clients outside my country. .Wide range or working flexibility. "Hit or miss platform for finding freelance work or hiring freelancers"
Good time-keeping system and an exceptional diversity of projects available to freelancers. The main issue I have with Upwork is the generally low level of pay/quality for most freelance projects. I've freelanced for years and rarely come across such low-ball offers for talent. Also not a fan of using bank accounts to verify U.S. location. 1) If you are a freelancer, don't waver on your hourly/per-project price. There will be projects and project leads who will pay your price; it might just require patience. 2) Don't use all of your connects early in the month. 3) Don't rely on Upwork alone to find freelance work due to the fee that they charge per hour/project. Generating new leads for my freelancing business, networking with others who are working in the same space. "Just another online freelancing service"
I like the search functionality and its features such as "Recent Searches" and "Search Suggestions". The main core of these kind of web services is "Search" and it should works very well to keep the service alive and in Upwork it works fine. After working a bit with Upwork, I found that sometimes people who post a job has no knowledge / idea about what they are looking for, thus their criteria on a project is not correct. For example, someone is looking for a mobile app developer to develop a complicated app (based on the his description) but their criteria is €200 for an expert which doesn't match with the project! So, I believe there should be some guides and hints for these people there. I believe there is a big need of a strict pricing policy for freelancers and employers based on their experience, the amount of job they want, etc. Although, having this kind of policy needs more manpower and some manual controls over the contracts and profiles but I think it helps Upwork to stay above other competitors in this way. Upwork is good and as I mentioned, if you are a freelancer, you need to have an account there too. Its a service for freelancers to find remote, temporary or permanent jobs around the world! So, if you are a freelancer Upwork is one of the websites you need to signup for. "My UpWork Review for 2018"
Number of jobs posted there, lot of opportunity. Easy to use, lot's of tools for the Developer. That you have to be "ranked" based on your "UpWork" Developer-Client experience to qualify for 90% of the postings there. Kinda hard to get ranked if you cannot get any work due to the "Rating System" that they use. I've been a Developer/Programmer since 1994, and am as good as most out there, but I cannot get any work that is remotely worth doing due to the rating system. Use if no other option because if you are a new user - you will have to work for "Pennies on the Dollar" just to get your rating up. "Occasionally" getting more exposure to the Tech world out there and Financial Income. "Good to find freelance if used right"
I can work on projects I would never hear of. Once you're a top rated person in your area, UPworK actually send projects to you to consider. The key think if you use it it, only apply for PAYMENT VERIFIED assignments. That means the money is already in escrow. The other think I like is that I can be sure of getting paid. That's worth something too. The 20% fee is high, but only applies until you reach $500 in billing PER CLIENT. Then it drops to 10% which IMO is worth it. Pick the clients you reach out to carefully and it will be worth your time. Don't apply for everything. Getting new clients. I'm a writer and brand strategist, and I've created relationships with some perfect clients. "Great Way for hiring developers"
You get to hire developers from all field just like freelancer and is also one of the competitive service which provide similar services,but the best part of upwork is its payment transparency and low commission cost. Variety is not available and chat option should also have option for video call which will make it much good in this segment. Preferable option for hiring freelancers because it has some advanced features which are required on this platform and is also user friendly and secured. We use up work on daily basis for getting our work done which might be as small as data entry or data formatting to as large as a part of project for which we lack expertise and so we rely on upwork for the same. "UpWorks is a great tool for hiring freelancers"
The rating system ensures that the quality of work is known to all. Every now and then the site is down for maintenance. Upwork is a great tool for hiring freelancers. The profiles include bios, portfolios, testing, and ratings to help you assess the skill level. it is also easy to hire and communicate with freelancers. You don't need to hire someone to handle bookkeeping since paying freelancers is easy and the reporting is very thorough. Customer support is great too. If there is a dispute, they will work hard to help you resolve the issue. I have been hiring freelancers for about 6 years...and I have gained clients for myself. It has saved me time and made the process very easy for me. I especially enjoy the record keeping that it saves me. "Quality contractors in a user-friendly online platform"
Ability to conduct end-to-end project and contractor management all on platform. Video conferencing platform a bit unstable. User interface can be improved; the distinction between Saved Freelancers, Archived Freelancers, Declined Invites, and the various job/proposal/message screens can be confusing. Sourcing experienced contractors to perform various marketing & lead generation projects. Benefits include being able to evaluate multiple candidates simultaneously, hire, project manage & administer contract all without leaving the platform. As a lean nonprofit, we do not have the scale to engage HR or recruiting service providers. Upwork enables regular business managers to self-serve the task of finding good talent to help with project needs. "Best site for hiring freelancer"
Upwork is best for outsourcing as well as hiring freelancers. It has good GUI and easy to work with. We can easily find a correct person to do our job. From freelancing point of view also it is very useful as many clients are available for work and one can different type of work here. I would recommend upwork for hiring freelancer.